For a number of reasons, I decided to revisit each and every scene in KS and take detailed notes on timing, in the attempt to put together a comprehensive calendar of what happened when. Unfortunately, this wasn't simply a Herculean task, but downright impossible. 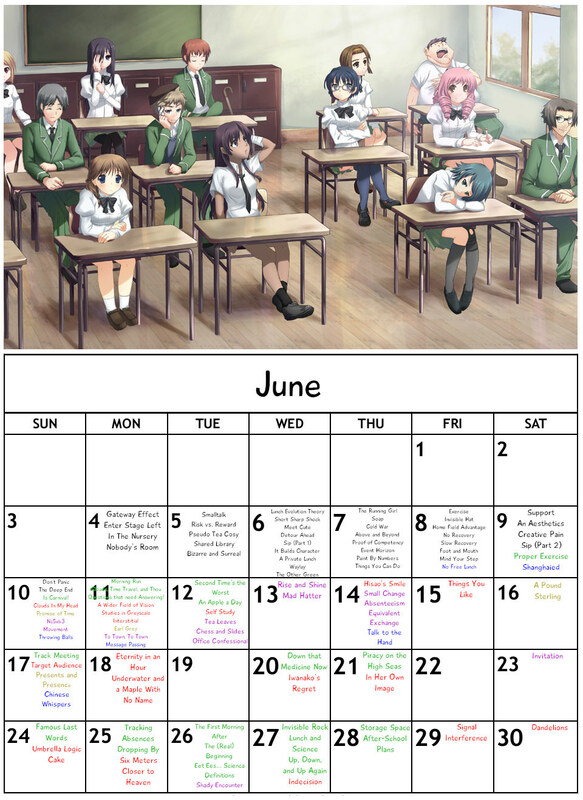 Aside from unavoidable contradictions between routes (e.g., the timing of Exams in Rin's route vs the others), some of the routes were in fact self-contradictory and work only in a conception of time beyond our comprehension (e.g., Lilly's route tries to cram something like 10 days between July 4 and July 10). To some extent, you could argue this is the effect of an Unreliable Narrator. In fact, in Rin's route, Hisao states "I try to grasp the passing of time, but it seems hard. I'm still used to the rhythm of the hospital, where trivialities such as the day of the week or time of day didn't really matter. Everything was the same, no matter what. Rediscovering the significance of time is an oddly disorienting experience, and I find myself enjoying the fact that I can categorize events in this fashion." This is a fancy way of leading into an important disclaimer: This is not an authoritative and canonical organisation of events, because such a thing is impossible. This is merely a "best attempt" to give all the events a specific day of occurrence while contradicting canon as little as possible. 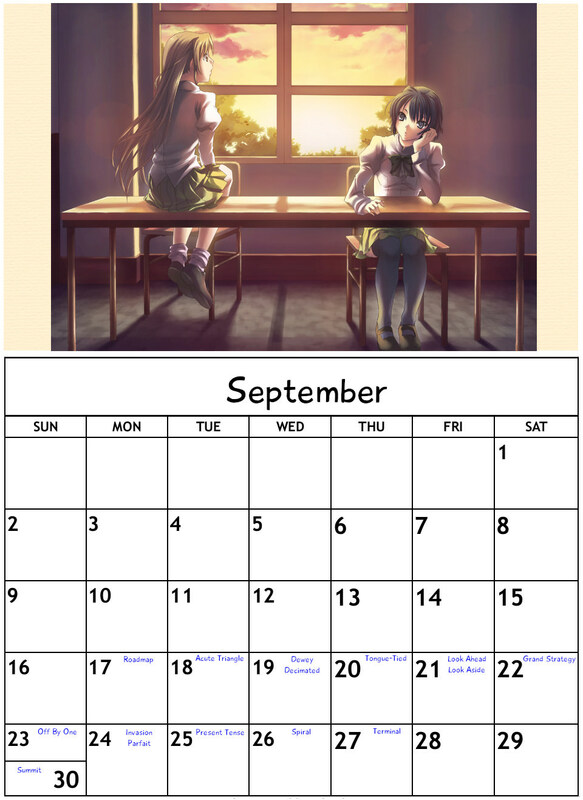 Generally, timing was based on absolute dates first (e.g., Lilly's citation of specific days, Hanako's Birthday, the Marine Day three-day weekend), following the logical and officially stated remarks that KS takes place in 2007. The next place I checked was relative time references (e.g., the next day) and references to specific days of the week (If the last scene was on a Tuesday, and the next takes place on Monday, it means at least six days have passed. Due to the impossibility of some of the relative time references, I tried to at least honor Hisao's relative timing claims as either "one day" or "more than one day". Emphasis on "tried". Finally, a note on Tanabata. Depending on where you are in Japan, it's celebrated anywhere from July 7 up through some time in mid-late August (one lunisolar calendar I found for 2007 places the "traditional" date for Tanabata at August 19). 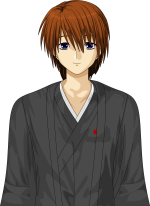 Only Lilly's and Shizune's routes care about Tanabata. 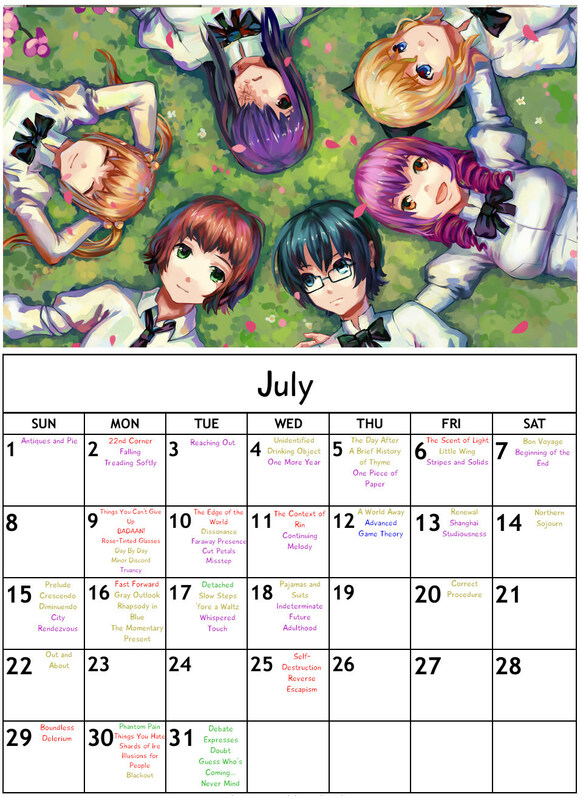 In Lilly's route, Tanabata takes place after Hanako's birthday (July 10) and exams ("A couple weeks"). The implication is that Lilly leaves after classes and before Tanabata, but Shizune's route presents Tanabata as happening after exams and before the end of classes. As I stated elsewhere, my conclusion is that Lilly's too busy packing up her life to leave forever to be able to attend Tanabata, especially when her imminent departure would be placing a pall over the festivities. Ergo, I placed Tanabata at August 7 - a popular compromise between the Gregorian and Lunisolar reckonings. For a detailed deep dive, I put together a shared Google Calendar, available HERE. For a more user-friendly presentation, I put together some pretty color coded calendars for the most eventful months. Damn, Prof! Thank you for all your hard work on this. You put a lot of hardwork and effort into this. But you don't start with Hisao's heart attack, so I'm going to dock points. No perfect score for you. Hisao's heart attack likely happened around Sunday 25 Feb 2007. It was the coldest day in Japan that year; in fact, it was the only day in Yokohama (for example) that it snowed. Because Sunday's not a school day, it must've been Monday 26 Feb if they were meeting after school. The snow would still have been around; Monday was also a cold day. This would have given him a reason to miss graduation in March that year, especially if he had complications. I wonder why he didn't transfer to Yamaku in April though, which is when the school year starts. Sae says that her husband died 17 years and 4 months before Rin started living in the atelier. Do I get bonus points? Last edited by brythain on Wed May 23, 2018 1:48 am, edited 1 time in total. This is not an authoritative and canonical organisation of events, because such a thing is impossible. This is merely a "best attempt" to give all the events a specific day of occurrence while contradicting canon as little as possible. This is excellent, and as authoritative as it gets. Thanks very much! 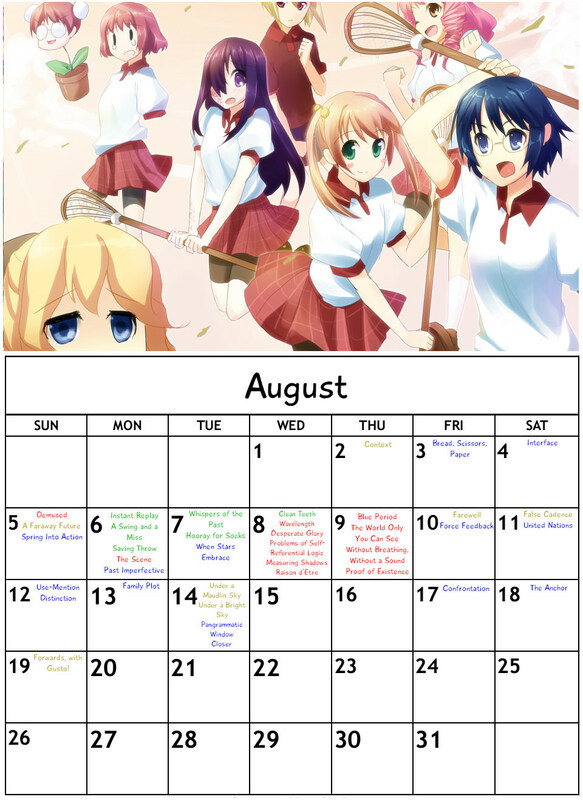 I'm shocked that Oddball was only looking at the pretty pictures I posted; the calendar does in fact start with Hisao's heart attack. I'm inclined to disagree with your estimation of February 25, though. Iwanako's letter refers to "quiet days" in February and March. Additionally, she opens by discussing the administrivia of the third-year for their class, further implying that she hadn't visited after third year started (it would have at least given her more to talk about to desperately maintain the illusion she was trying to keep). Add in Hisao's initial statement that Iwanako stopped visiting after six weeks, the heart attack would most likely have occurred during the last week of January or the first two weeks of February. No chocolate was mentioned, presenting an argument that the events happened before February 14. That gives us a window between January 29 and February 13, and would most likely be occurring between February 5 and February 9. I can't really argue the weather thing (mostly due to lack of information), but it's easy enough to handwave localised snowfall. This is amazing! I wasn't relishing trying to do this myself, even as a messy private reference. Ya I know I'm late to the party. Dr. would not let him leave the hospital for 4 months, this is why he went in June. Because his condition was not known until he was 17 then had his hart attack yes 4 month is pushing it, I have seen older patience's taken well over a year to get everything settled so they can go home. The way it sounds he has the more sever type of chronic arrhythmia and congenital heart muscle deficiency. Looking up when Marine day would have been in 2007, it would have been the 23rd July, the third Monday of July which would put the 3-day weekend between 21st-23rd. On yours you have it the week prior. Is that due to the game? Everything I've looked at has pointed toward 16 July. What's your source for 23 July? Could it vary by region like Tanabata? No. It's a national holiday, inaugurated in 1996. Wikipedia is our friend.